Thanks for Working Your Magic! It's here! November 5th is International Volunteer Managers Day (IVMDay)! 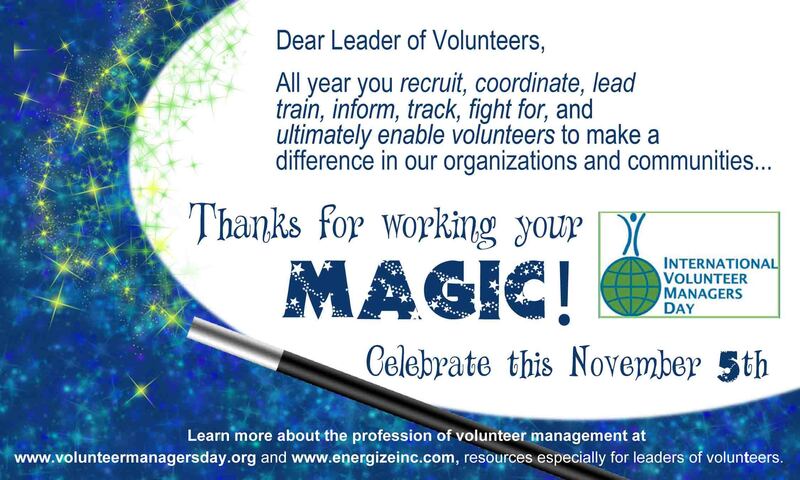 As promised, Energize has continued our tradition of creating an annual thank-you card ready to send to your colleagues in volunteer management. Go to the banners and posters area of the IVMDay site to download it and the other free colorful materials and logos available for your use. Ever walk into a bookstore or library and head straight to your favorite section just to browse for books you don't own yet? You can do the same in the Energize Online Bookstore. Visit the Books and Articles Organized by Subject page for a list of key subjects within the field of volunteer management. Whether you are looking for books on volunteer recruitment, the philosophy of volunteerism, diversity in volunteer engagement, risk management, or anything else, this is the place to start. Plus, following the list of books on a specific subject, we've included a link to e-Volunteerism articles on that same subject, making this the ideal place to do wider research. The Energize Volunteer Management Resource Library is, of course, also organized by subject. But have you noticed that at the top of each library page we've given you a link to "see books and e-Volunteerism articles on this topic"? So it's all integrated to help you find the most information to answer your questions and expand your knowledge. Volume XIV, Issue 1 of e-Volunteerism, our international, subscription-based journal for informing and challenging leaders of volunteers, launched in mid-October and will run through mid- January. Entities that most colleagues recognize as volunteer centers exist in many countries around the world. Although some are effective and creative, too many volunteer centers have never been visible in their communities or received adequate funding - but they still have loads of potential. Rob Jackson and Susan Ellis open a dialogue to be expanded in the April 2014 issue of the journal. Our reader-created "word clouds" are ready to view, download, and use! Star Power: Celebrity Support of Charitable Events and Activities- UK author Sean Kelly reports on his useful study of what celebrities think of their charitable volunteering, and how you can engage noted people of all sorts to support your cause. A Unique Model: A Personal Account of an Innovative Volunteer Program - Andy Fryar (on the journal's editiorial team) at long last provides an in-depth article on the unusual structure of the hospital-related volunteer corps he leads in South Australia. Pets and Volunteering: Surprising Connections - Erick Lear takes us Along the Web to explore the trending topic of volunteer opportunities available for pets and their human companions. Still to come in this issue are articles on: managing volunteer conflict in churches; a personal reflection on how we treat volunteers; a review of a study on accountability for volunteer contributions; and a Training Design on how a British charity has learned to use e-learning to cut down the time needed to induct and train volunteers. Don't miss out!